Replacing my purse with a big, colorful backpack — much easier and better for my back to carry things around this way! 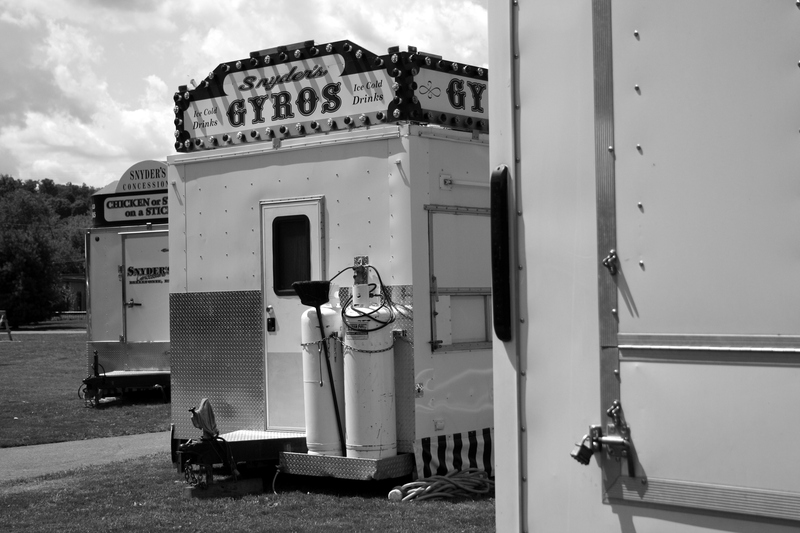 Here in Pennsylvania, summertime is the time for county fairs and arts and crafts festivals. That means lots of delicious, greasy/sweet/fried fair food! This quirky blog about mental illness was recommended in my WordPress feed this week. These drawings are open, honest, and informative…they really do capture bipolar disorder (in stark black and white) in ways that words alone fail. My favorite so far is the June 16th post that depicts what it feels like when meds aren’t working or have troublesome side effects. Please check out this eloquent and powerful artwork! Staying organized is so important to my mental well-being. It’s well documented that people with bipolar disorder tends to be creative types and thrive on project-based work. However, people with mental illness tend to do better with a routine. For me, a routine and schedule provide a sense of security and the ability to accomplish more during the day. My day planner. If I don’t write things down, I tend to forget them. 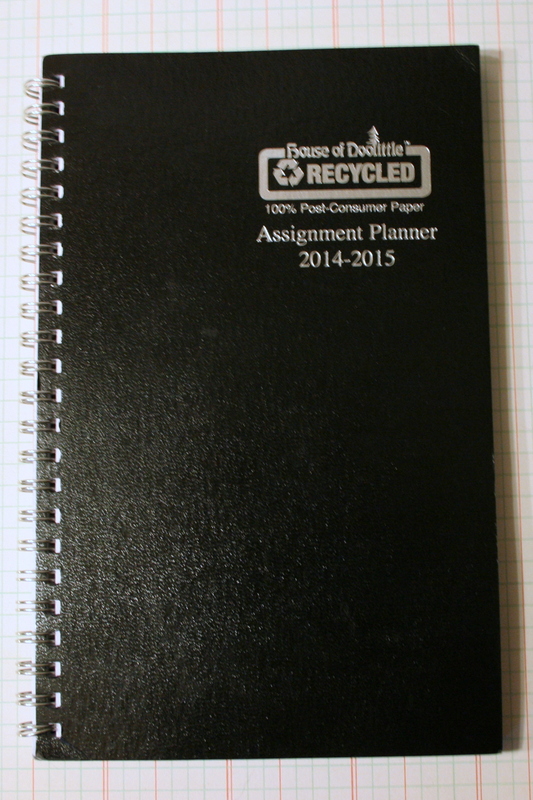 I recently switched back to a pre-made planner that I bought from a store. I was using a planner that I made myself but it was an 8.5 x 11 binder, and I found that it was too big to carry in my purse. 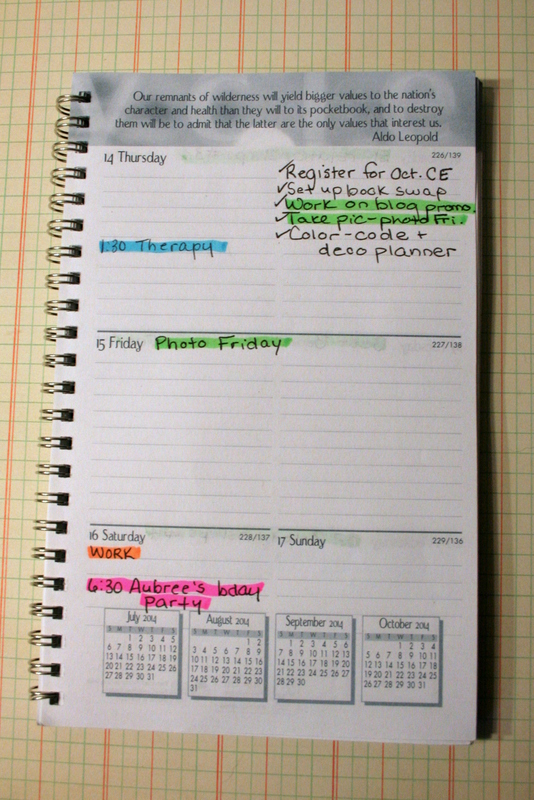 Here’s a picture of a planner page from last week. I use highlighters to denote different types of activities. 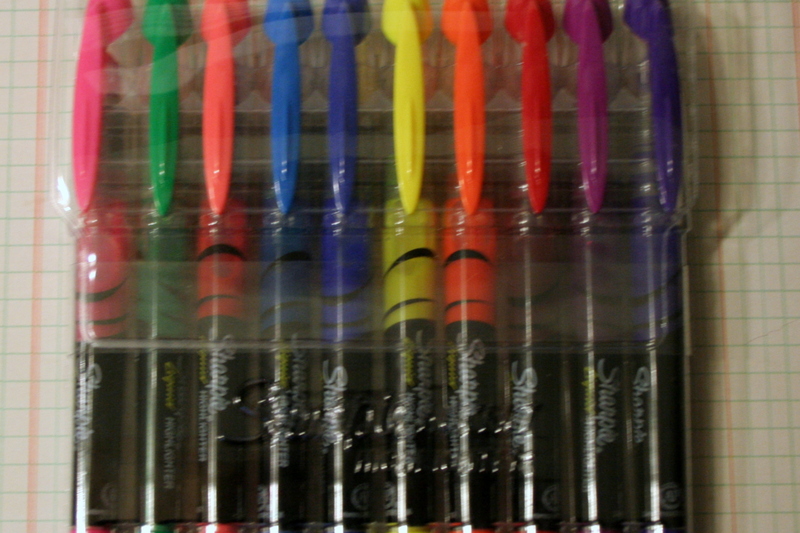 My favorite brand of highlighters is the Sharpie brand because they come in many different colors. At the top of each day I write the title for my blog post that day. On the left-hand side, I write appointments and their times. On the right-hand side, I write my to-do list. 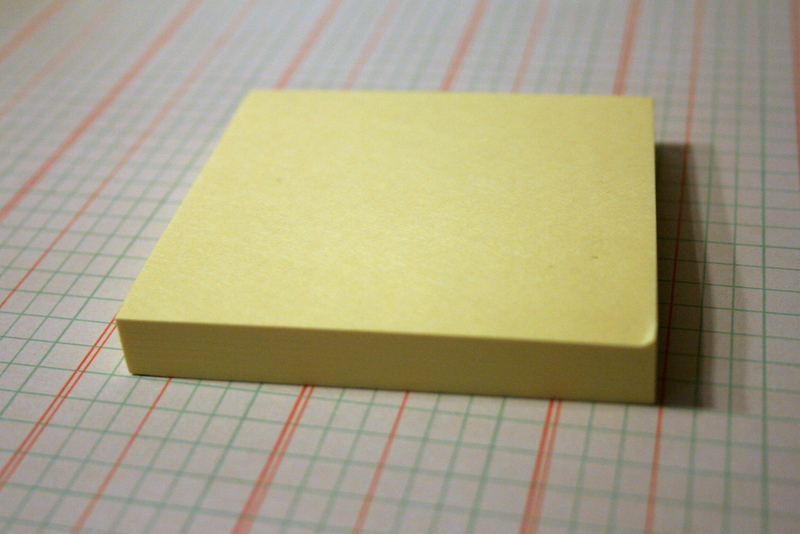 I’m also a big fan of Post-it notes. The back of my desk, my craft area, and my office space at work are littered with Post-its full of notes, reminders, and ideas. These are random spur of the moment ideas that don’t fit into my planner or are more urgent. My padfolio goes everywhere with me. I use the notepad to write down ideas for blogs, notes on books I’m reading, and to write whatever comes to mind while I am out and about. 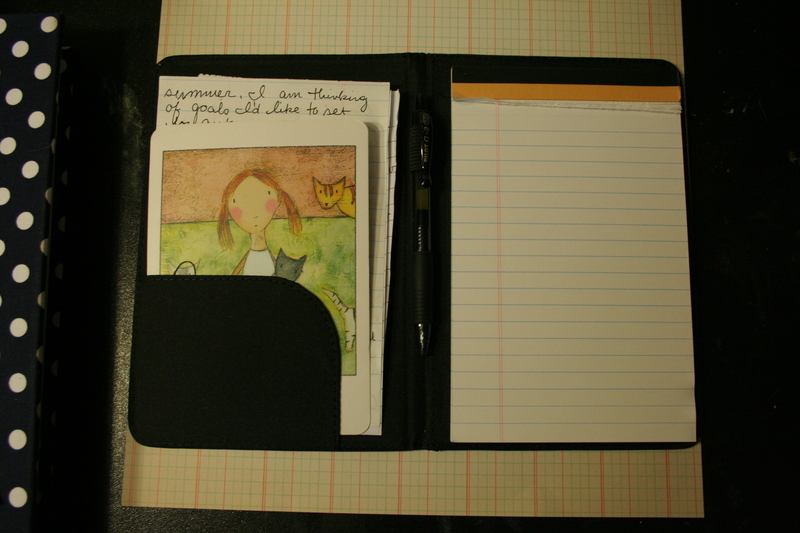 I tuck letters, mail, and other tidbits in the pocket on the left-hand side. I carry a variety of pens with me in a zippered pencil case. I also keep a book log so that I can look back at books I’ve read. In my book log, I keep track of the title, author, and number of pages. I have a written book log, but I also have shelves to organize “read” books on Goodreads, such as my “2014”shelf, which lists all the books I’ve read this year. I like project oriented work, but because I need routine, I try to work on my projects within a schedule. For example, I will set up a project for a specific week or month and give myself a deadline. This may be to write a specific number of words during the week or to finish a certain number of pages in my scrapbook. On days when I’m feeling particularly disorganized and I have a lot of free time, such as my day off, I will sometimes write a very rigid schedule so that I don’t waste time being indecisive. …and so on and so forth. That may seem really strict and impractical, but when I’m feeling indecisive or a lack of focus, it helps me stay on track to get things done. Every person will have different organizational needs. This is just the method that works for me. Below are some links to other planners that I like. Enjoy! 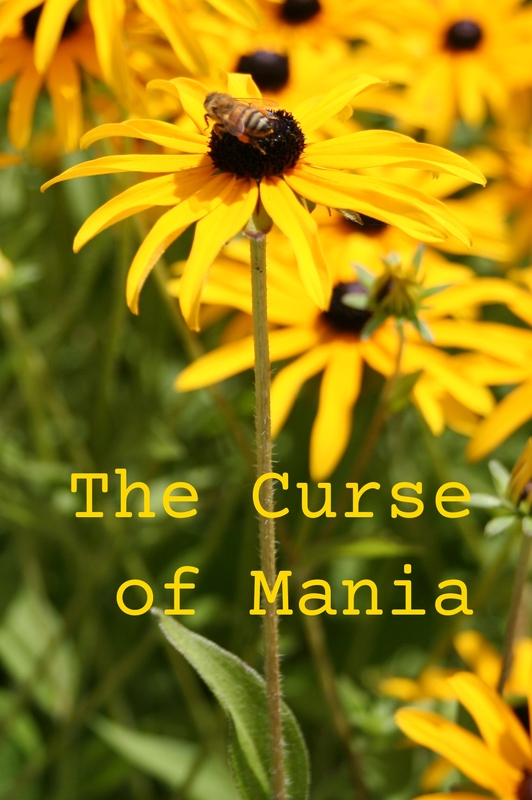 This post is a follow-up to a post I wrote last week: The Blessings of Mania. This is the flip side, what happens when mania stops being fun for me. Imagine you are watching a nature documentary about bees with the volume turned the whole way up on your TV. On the screen is a huge swarm, which buzzes loudly. A narrator is talking over the bees, telling you about their behavior, but there’s still that buzzing in the background, and it’s kind of annoying. That’s what the inside of my head started to sound like after almost a week of mania. My internal voice was still there, but my thoughts were noisy and chaotic and made me headachy. I spent a whole day lying on the couch, staring at the carpet, unable to sleep because I was brimming with energy and unable to stand up and do anything without pacing the downstairs of our apartment. Three or four hours into it, I lost my ability to read without skipping sentences or forgetting what I’d just read. I tried to watch TV, but the sound of it grated against the loudness in my head, so turned it off. I called my mom, my best friend, and eventually my doctor. They finally assigned me to a new psychiatrist, but he couldn’t see me for two days. Over those two days, everything became infuriating. I hated the mental health industry and the new doctor I had never met. How dare they assign me to someone who specializes in geriatric psychiatry? I’m not even 25 yet! They just want to pass me off to the first schmuck who will take my insurance. The dirty dishes in the sink, lint on the carpet, and the puppy’s accidents in the house made me livid. No one cares what happens in this house. I have to do everything. I’m totally alone in this. Minor peeves became a crisis. I started picking fights with my fiancé over petty things. Then the impulses started: I’m no good here. I should run away. My fiancé won’t let me run away. If I could just harm myself I would feel better. I don’t want to die, I just want this to stop. Maybe I should just overdose and get it over with. I want to disappear. Everything around me and inside me—people, my pets, the neighbors outside, my own thoughts, and time itself—felt like cars flashing by on a highway. 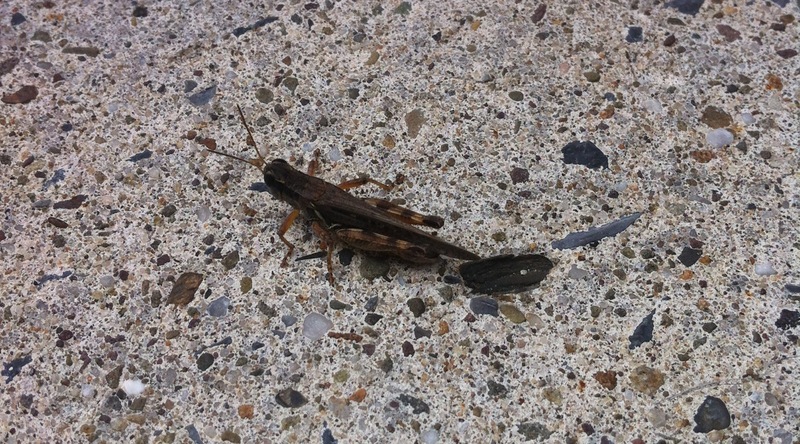 I felt like the “real” me had checked out and left me with this monster in my body. My fiancé became visibly weary and verbally expressed his exasperation with my mood shifts and his frustration at feeling powerless to help me. I started having problems at work. I had to cancel my vacation to Virginia to see my best friend in September because Big Bee doesn’t want me traveling alone like this. I started to feel like I needed to be in the hospital until my impulses and anger felt more controlled. I started thinking about the past hospitalizations, how it’s been almost four years since the last time, and how desperately I don’t want my life or my mental health to return to the way it used to be. Somehow, I made it to Thursday morning to see my new doctor. Contrary to my angry thoughts about the whole thing, I think I like him. He listens carefully to what I’m telling him and explains all the scientific stuff I like to know about my brain chemistry and meds. He put me on a mood stabilizer I’ve already tried twice, under the theory that I’ve always needed high doses of other mood stabilizers because I metabolize them too fast to make them effective, and maybe I was never on a high enough dose of this one. He put me on an atypical anti-psychotic because it’s going to take 2-3 months to reach the optimum dose of the first medication, and I told him I couldn’t go on feeling this out-of-control for that long. He refilled my anxiety medication, and he told me that if I wasn’t feeling better in a few days, we would talk about admitting me to the psych unit until I was stabilized because it seemed like I was starting into a dangerous mixed episode (symptoms of mania and depression simultaneously). I’m tired and kind of achy from my new meds, especially in the morning when I first wake up and feel groggy. My mind still goes too fast some times, but it doesn’t last too long. I feel more steady, less temperamental. I’m sleeping and eating again, which I think might be the most important factor in how well I’ve been feeling the past few days. It’s not perfect. My focus and memory are still off, I’m having trouble keeping track of time, and I’m not depressed, but I feel deflated. The energy and drive of last week isn’t there anymore. I’m glad the worst of it seems to have passed, but I’d be lying if I said I envisioned myself maneuvering into autumn without some hiccups in the whole process. The meds have done one really spectacular thing: I’ve come down enough to gain some perspective on the last two weeks, and I’m not being so hard on myself now. I know this was caused by coming off of my old meds. I know I’m not a monster and that my healthy self isn’t gone forever. That gives me hope, and hope keeps me from giving up. Watching Whale Rider with Big Bee — I get pretty excited when I find movies he hasn’t seen. Yesterday, I talked about why setting goals is important to me. 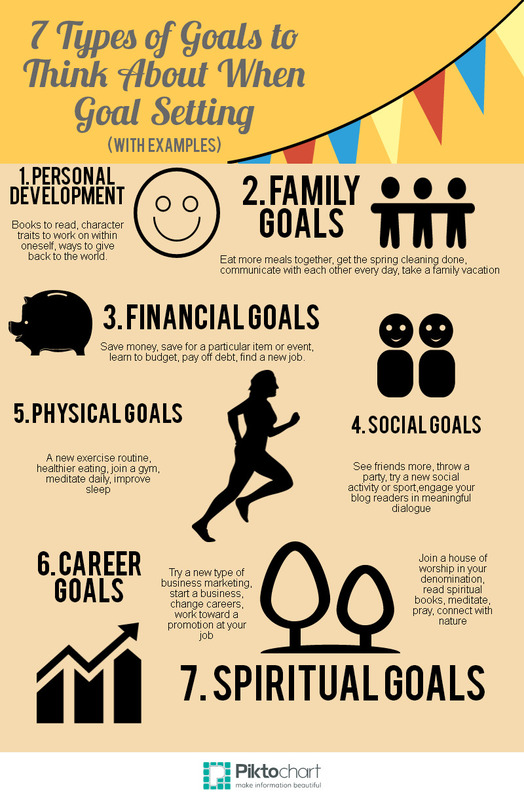 Here are my goals for autumn 2014. 1. Personal development: Meet or surpass my goal of reading 20 books this year. 2. Family: Work on training my puppy using clicker training, and have her fully housebroken by winter. 3. Financial: Save 1/4 of every paycheck. 4. Spiritual: Continue to have quiet time and meditate every morning before I start my day. 5. Social: Visit someone or have a long phone conversation at least once a week. 6. Physical: Drink 8 glasses of water per day instead of drinking coffee all day long. 7. Creative (I am replacing my career goals with creative ones): Write 8,000 words of my novel. Catch up on the “summer” section of my Project Life scrapbook. Please comment with what you’d like to accomplish this fall! I’d love to hear what you’re working on! One of the most helpful things I learned in massage school was to set long-term and short-term goals and come up with steps to achieve them. At the beginning of the year, I set goals instead of making resolutions because I’m more likely to keep well-laid-out goals. I also want to get into the habit of setting smaller goals more often. Looking back at the goals I’ve met gives me a sense of accomplishment, helps me with personal development, and keeps me in a positive mindset. As we near the end of summer, I am setting goals I’d like to accomplish this autumn. 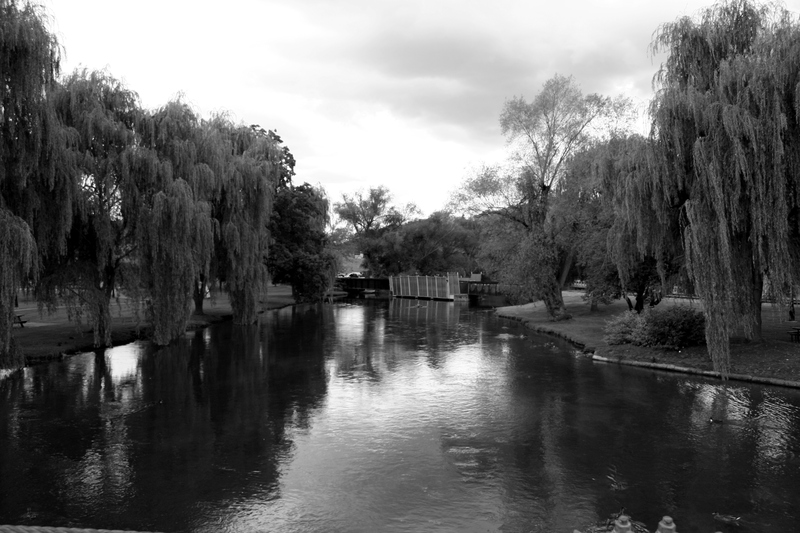 I took this photo from the park bridge. I love the way the trees line the water. Happy photo Friday! If you’ve been on Pinterest lately or have been reading health blogs, you know that they are saturated with health fads ranging from special diets to extreme workouts. Not every health fad is right—or even safe—for every person, and I think it’s important to do research before jumping on any bandwagon. Articles like this make me chuckle a little. Still, here and there, from reading and trial and error, something sticks…and I stick with it. Here are 5 health fads, discovered through blogs, that have become part of my normal routine. Raw Milk: I admit, I stumbled upon this one on Pinterest and went on to read other things without looking back. The idea that raw milk tasted better than pasteurized milk, let alone had health benefits, seemed like some off-the-wall hippie stuff to me. My interest in drinking raw milk was actually piqued when I talked to a young Amish girl selling it at one of the farmer’s markets here. “Does it really taste any different from pasteurized milk?” I asked. “I don’t know…I’ve never tasted pasteurized milk.” Never? I thought everyone drank normal milk! I finally gave in when it was for sale at the Amish-owned market that recently opened near our apartment. I bought half a gallon and drank it for a week. It was good, fresher. I didn’t think it tasted so different until I went back to drinking pasteurized milk the next week and found it had a strange, unpleasant aftertaste I had never noticed before. So I’ve stuck with raw. It also doesn’t give me stomach upset like pasteurized milk products. It’s illegal in some states, regulated in others, and fine for retail sale in a few. You can read more about raw milk and its benefits here and check your states regulations here. 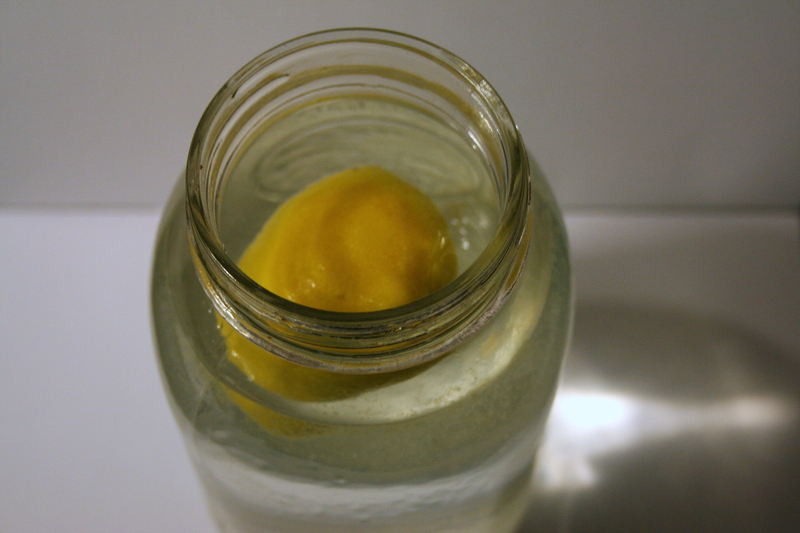 Lemon Water: I love to drink water, but lemon adds a little pizzazz. It’s done wonders for clearing up my skin. Healthy and tasty! Meditation: I’ve tried a few types of meditation, but mindfulness meditation is probably my favorite, and the type I am currently practicing every morning before I start my day. It helps me to focus on the present, relieves anxiety, and starts my day off with a positive frame of mind. Learn more about the types of meditation and its benefits. Apple Cider Vinegar: Healthy but less tasty, apple cider vinegar (or ACV) is next on the list. Apple cider vinegar is one of those good-for-everything substances. I’ve used it as hair conditioner (mixed with raw honey), flea repellant for the dogs, disinfectant, facial cleanser, and, as my acupuncturist recommended, as a way of balancing the acidity of my stomach so that I don’t get nausea and acid reflux. Check out more uses for ACV here. I’ve tried drinking it watered down or warm and mixed with honey, but I find the quickest and easiest way to get it down is to take it just like a shot. 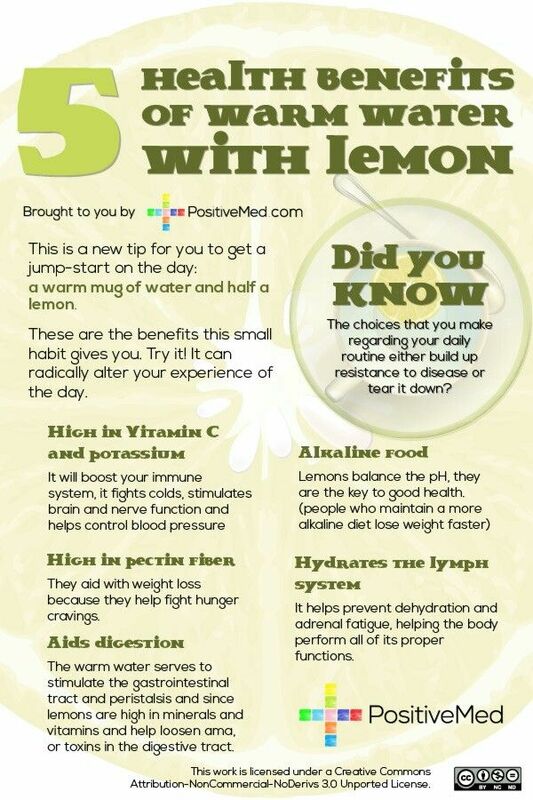 My acupuncturist recommended up to a quarter cup per day, although a tablespoon or so usually does the trick for me. I use the drink two caps full from the cap off the bottle. No-Poo/Co-Washing/Curly Girl Method: Alternative hair care has saved my curls. They are much tamer and less frizzy than they used to be, and my hair is soft all the time. I have been through several incarnations of alternative hair care, all of which involved cutting out shampoos that contain sulfates and other surfactants that can be harsh on hair. First I tried the No-Poo method, which I first read about in this post on one of my favorite blogs, Musings of a Kitchen Witch. This method promised a 2-6 week adjustment period, in which my hair might be greasy as the natural oils became balanced again. Eight weeks later, I still felt sticky and gross. A lot of people love this method, it just wasn’t for me. Then I read the book Curly Girl which taught me about different types of curly hair and the various ways to care for them. I also stumbled upon Naturally Curly, where I learned about co-washing (washing with conditioner instead of shampoo). My current routine is conditioning once or twice a week, rinsing and massaging my hair under the shower water in between co-washes, and ACV for product buildup. When I treat my body well, I feel good about my body. What little things do you do to treat your body well?